Bertram House, on the corner of Government Avenue and Orange Street, occupies an important place in the history of South African architecture. It is one of several buildings erected within the original confines of the Dutch East India Company’s garden. It is partly hidden by a high wall near the top of the Avenue, on the western side. After the second occupation of the Cape Colony by the British in 1806, architecture at the Cape came under strong English influence. 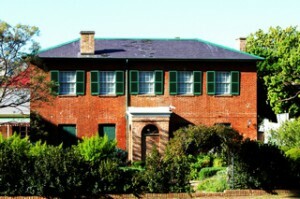 Between 1820 and 1837 it became fashionable to build Georgian brick houses in South African towns, and Bertram House is one of the few surviving examples of this style in Cape Town. It was built about 1820, very probably by Edward Durham, a contractor, who founded the firm of George Finlay and Sons of Cape Town. The house was an asset in Durham’s estate when it was sold in 1839. This house clearly expresses the more important features of Georgian architecture. The exterior is undistinguished; a cube-shaped double-storied building in which the natural colour of its unplastered and uncoloured brick waIls is emphasised. It has sash windows and semi-circular fanlights surmount the doors. While the exterior of the building is plain and simple, much attention has been given to the interior. The rooms are spacious and lofty with decorative wallpaper and attractive cast-iron fireplaces. They are arranged en suite and connected by large folding doors. A striking feature of such houses is a sturdy but elegant stairway, and the furniture is fully in harmony with the rooms.